← A Runner’s Alphabet—Q Is for. . . . I originally published this blog almost exactly a year ago as advice for what do to after a long training run. Especially during this very hot summer, Constructive Rest will replenish your mind and body if you take the time for self-care. Congratulations—you’ve finished your long training run! You’re probably exhausted but very happy and (I hope) uninjured. Allow yourself to enjoy that feeling of sweaty pride—you’ve earned it! What do you do next? If you’re like me, you’ll eat something light (a banana, say) and drink some water to see you through the trip home. You’ll do your stretches—an absolute must after a long run!—eat something more substantial, and clean up, in whatever order you prefer. After that, you might have a nap. Here’s something else you can try: Constructive Rest. What’s Constructive Rest? 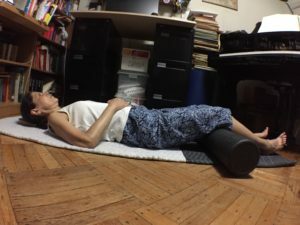 It’s a very simple type of self-care that will help you release excess tension from your mind and body, especially your spine and legs. It’s not just for runners, it’s for everyone! And even better, you can do it whenever you need to calm down your mind and body, say, after a hard day at work. 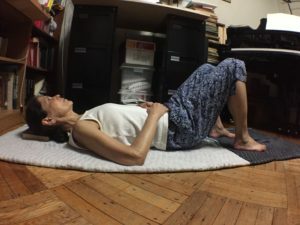 For Constructive Rest (CR), you don’t need any kind of special equipment, so no need to rush out and buy a special pillow or mat! The basics are simple, the variations are endless. If possible, pick a time of day that’s relatively quiet and preferably not right after you’ve eaten a big meal. This isn’t nap time but a time of waking calm and quiet. Keep your eyes open and soften your gaze. Put something under your head. This can be a few thin paperbacks (larger-size ones, about 6 by 9 inches or about 15 by 23 cm). Finding the right height for you will take a little experimenting. If your head feels as if it’s tipping back and down, add a book or two. If your chin feels pushed down toward your chest, take a book or two away. Keep your knees apart. If they fall together, try adjusting your feet. Let your hands rest separately on your abdomen, and let your elbows rest on the floor. Allow the floor to support you. Your back won’t be completely flat on the floor—there will be spaces where it doesn’t, like the back of your waist. Take the time to explore where you might be holding excess tension. Are you holding part of your back up off the floor, or maybe your shoulders? If so, remind yourself that the floor is under you, and let yourself settle. Every so often, remind yourself that you’ve earned this lovely time of peace and calm. Breathe through your nose; exhale quietly. If your legs feel uncomfortable after being in one position for a while, gently extend one at a time with as little effort as possible. You want to get rid of tension, not add it. CR isn’t a fixed pose, so you can change positions whenever you need to. I recommend keeping one knee bent while you extend the other leg to put less strain on your back. How long should you stay in CR? I like to rest for 15 or 20 minutes. I set a gentle chime tone on my phone to mark the time. Your CR time doesn’t end when the chime goes off. You want to extend that same mental and physical calm as you get up. Gently roll to one side and press yourself up with your hands till you’re on all fours. Then use your chair or another piece of furniture to slowly come to standing. Continue to enjoy that refreshed, calm feeling as you quietly put your props away. You don’t have to do CR the same way every time—in fact, you probably won’t want to. Our bodies change every day—and even over a single day—in very subtle ways. 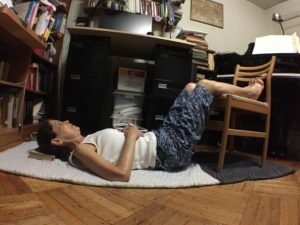 One day, you might want fewer books under your head; another day, you might want to put your lower legs on a chair instead of having your feet flat on the floor. The point is: this is resting time for you to enjoy. In other words, make it nice for yourself!